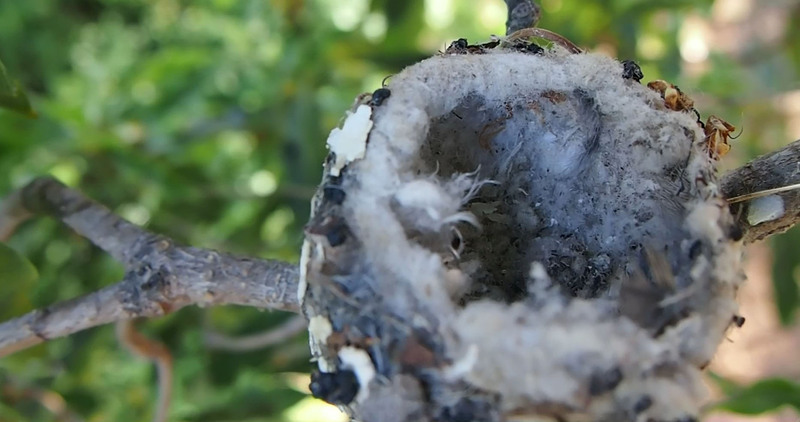 An ultra-awareness of the fragility of new life comes with the territory I trod in observing hummingbirds brought forth into the world via our property. But that doesn’t make it any easier whenever I’m taught the next in a continuing education of harsh lessons on that subject, such as the one today. I had concerns yesterday evening when I found the backyard nest suspiciously super-still. Neither of the chicks, which by yesterday had grown enough that both their heads stuck well out above the nest’s rim, were visible And there was nothing in the way of movement coming from within the nest. This morning, the same thing. And to make the situation more dire, the sun shone through the nest wall that would never have penetrated if there were chick bodies in there. A search on the ground yielded nothing but a torn shred of nest material. This afternoon, I finally couldn’t stand not knowing anymore and sent up a probe visible below, realizing my fears. The nest was entirely empty. Both chicks — nowhere near the fledge stage — were gone. I can only conclude that another bird, maybe a jay, discovered the nest and raided it and the two chicks, which had been doing so well under the dedicated and diligent care of their mother hummingbird, are dead. Another more thorough and cautious search of the ground around the site yielded absolutely nothing. There is some consolation in that it wasn’t worse. The mother could have died while getting food or water and the chicks could have perished a slower death in the nest. While I didn’t actually see the mother, I did hear some clicks in the area that are probably hers. I can only hope she’ll try again, but I’m pretty sure she won’t attempt it here and instead will do so from a new nest in a completely different location. UPDATED (3.05): Yep, pretty sure it was jays. Found a fast-moving sinister pair methodically casing the branches of the same tree this morning, as if returning to the scene of the crime in search of other nests to pillage. This entry was posted on Sunday, March 4th, 2012 at 3:17 pm and is filed under adventure, animals, nature, obituary, seasonal. You can follow any responses to this entry through the RSS 2.0 feed. Both comments and pings are currently closed.